Sorry if this was posted twice. I thought I posted it 2 days ago but people are saying the link didn’t work. On New Years we were scheduled to leave Quetzaltrekkers at 10am. Kristi and I were asked to pick up some tables a couple blocks out of the way so we left the house early and ended up at QT just after 9am. We go to grab our water, but there is none. “Oh we ran out of water bottles so you have to go buy your own.” Thanks! I don’t have a problem with that but what if we had shown up just in time to leave or late? We go and grab 9L of water. Now it’s time to pack our bags, we’re given 24 tall boys of Tona and a 2L bottle of Aguardiente to carry up. I’m not sure why the horses we are paying for aren’t carrying this but my pack weighed in at 26kg and Kristi’s was 28kg. We finally left, way late and ended up on the same bus as the whole group. We were supposed to go ahead of the group and beat them up there by an hour or two. At the little town outside of Telica, San Jacinto, Sam argued with the guy who owned the horses about the weight they needed to carry and how they were going to do it. San Jacinto is in known for its hot mud pits that you cannot bathe in because they are scalding hot so you can go and look at them but that’s about it. Lonely Planet puts it on their must see list but they may be over enthusiastic about this one. Kristi asked about dinner and was informed that they didn’t buy her a chicken breast and that they would make her a grilled cheese with tomato. She is visibly frustrated with the way things are going, as am I. She decides to eat at the commodore there and have our leftover pizza that we brought (for lunch) for dinner. We start heading up the volcano 90 minutes behind the group. This is not going as planned. Kristi and I are so frustrated between the weight of our packs and the blatent hostility in the group as everyone was frustrated for different reasons that we debated turning around and just going home. We decided that it would be better when we hit the top, we would just look after ourselves and not offer up our help if it was going to go unappreciated. Plus Kristi’s friend that she met while backpacking 2 years ago in Peru was on the trip and we wanted to hang out with him. It was a hard 3.5 hour climb to the top. On the way, 3 cans of beer puntured in my bag… it’s definitely waterproof. Unfortunately the smell of stale beer when hiking is not a pleasant one. We caught up with the group near the top which shows the pace we were pushing. I was so excited to get up there, drop my pack and peel off my sweat-drenched Quetzaltrekkers shirt that I didn’t even notice it was raining. It only lasted 5 minutes or so and we had a tarp structure set up because 2 guides came up the day before and set up. Camp looked awesome. 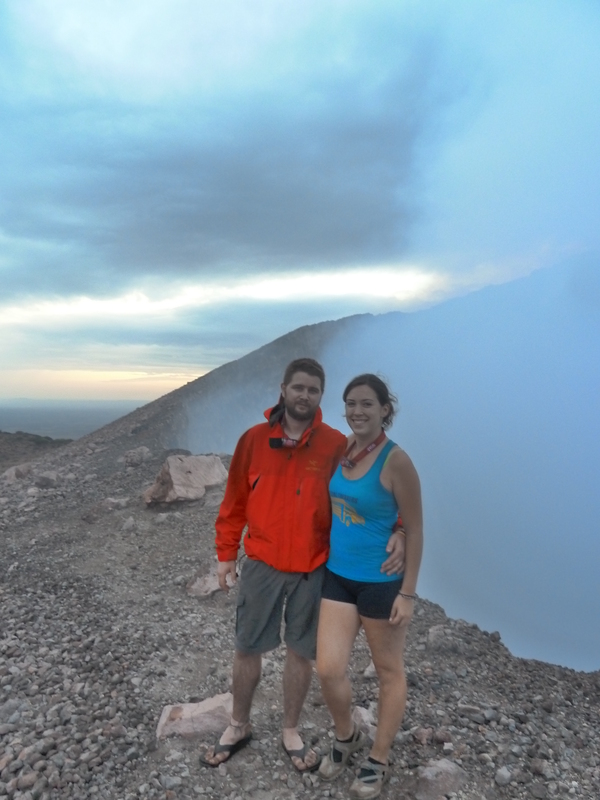 We hiked up to the crater which is an experience that is hard to describe. You look into the crater and can see the sulfer coming up giving it a cloudy look. When it clears up a bit you can see the lava glowing red/orange through the cracks in the bottom of the crater. It is just awesome. After that we stayed up at the top and watched the sunset. We headed back down to camp, set up our tent and I went over to the bar area. Since Kristi and I are bartenders, we decided to mix up some drinks and get this party started. We made a big pot of Mojito which according to most of the group tasted really good. I hate Mojitos and I was using the cheapest of rum, soda water, sugar, mint and lime. It worked out alright. Then we made another big pot of Aguardiente and coke. Our mix:alcohol ratio was about 1:1 so drinks were strong and I decided it would be best to stick to beer. We brought up 40lbs of ice so it was cold. We kissed, hugged, we happy new yeared and went back to sleep. We woke up 45mins later, had breakfast, packed up and got ready to go. The guy with the horses was still being difficult, telling Sam that he deserved more money and all kinds of crap. Sam was visibly frustrated. Kristi and I hung back to make sure the site was clean and nothing was forgotten. Again about 30mins behind the group, we managed to catch them, pass them and end up at the lunch place about 30 minutes ahead of them. Maybe I am getting a feel for this hiking thing. I am starving now so Kristi and I go ahead and eat. Just as we’re finishing up, Kristi’s friend Nick and his friend Ben (who woke us up last night) joined us at the table. We find out that some of the others that left earlier have been waiting for a bus for over an hour… the usually run every 20 mins. I guess Nicaraguans party a little too hard to work New Years Day. After 90 minutes and 2 busses passing us without stopping we call our reliable Volcano Boarding driver, Victor, to come get us. As we drive back into Leon it is like a ghost town. Nothing is open and it is almost eerie seeing it so quiet. We say goodbye and walk back to our apartment where we relaxed for a little bit (I washed out my bag and my QT shirt) before deciding it was dinner time. We went to Via Via for dinner then went across the street to Bigfoot to have a beer with Nick and Ben and their friends. We planned to keep it short since we needed to pack our house up and leave at 4:30am to go on our final hike qith Quetzaltrekkers. We received a call from QT while we were at Bigfoot asking if we could come help with some of the prep so we did that for an hour before heading home and going to bed.